The 1950s and 1960s brought us some truly amazing concept cars. Most of them, of course, never came to be…because they were weird. This one manages to be weird in a whole new way. 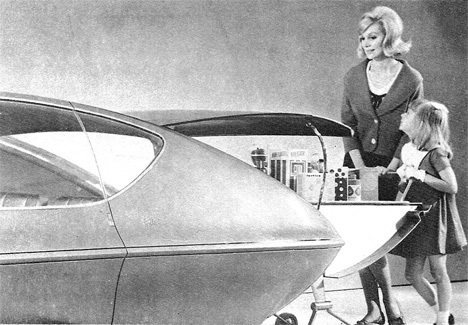 The GM Runabout concept car made an appearance in the 1966 book Automobiles of the Future as an ideal family car that would make shopping trips a breeze due to the two integrated shopping carts. The three-wheeled car also enjoyed some attention when it was displayed at the 1964 World’s Fair in New York. Its unique shopping cart feature would have made it simple to transfer groceries from the market to the car and into the home with a minimum amount of effort on the driver’s behalf. But what we’d really like to know is how filthy those shopping carts got since their bottoms were inches away from the road. See more in Concept Vehicles or under Transportation. April, 2011.